*This article contains affiliate links. If you click on a link, I may be compensated if you make a purchase. This helps keep MakingItPayToStay.com up and running! Becoming a virtual assistant isn’t like finding a job. Well, not usually, unless you’re being hired by as an employee. It’s really like becoming the CEO of your own business. Instead of a resume, you’ll need a website and a filled-out LinkedIn profile and possibly a full portfolio of examples of what you can do for the client. To become a virtual assistant, you will need to have a deep understanding of how it works, and who you want to work with. 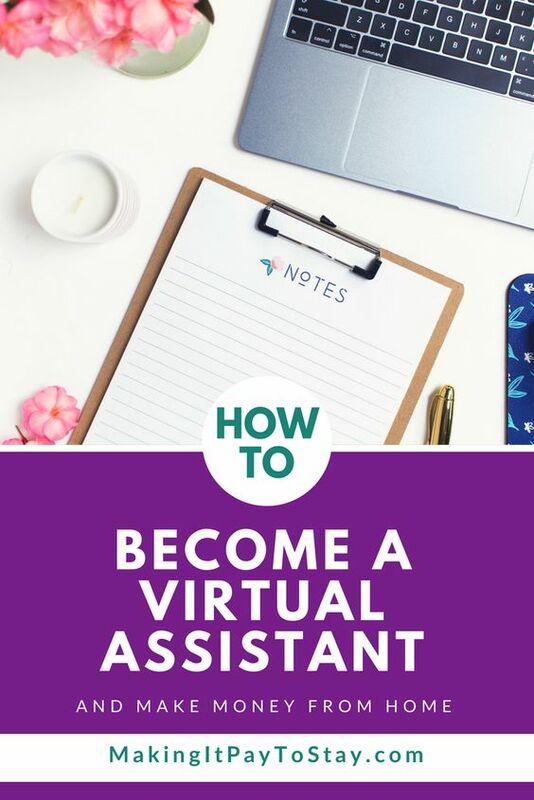 I’ve been a virtual assistant for over 3 years at the time of publication and have grown my business from scratch to now having 2 virtual assistants who work with me. 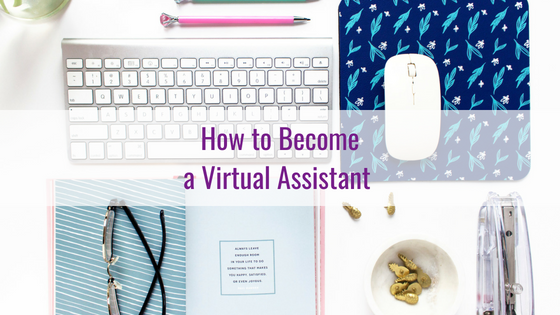 The demand for Vas is growing every day and there’s never been a better time to become a virtual assistant. Who do you want to work with the most, and what skills do you offer them that they need? Do you want to work with speakers and help organize webinars or in-person events? If you have skills in that area, you can do that virtually. Technology has enabled us to do all kinds of things without being there in person. If you’re just getting started, it’s ok to be a “generalist” as you learn new skills and figure out what you really love to do and what you’re good at while you’re earning income. Don’t let a lack of clarity on your niche keep you from getting started. You can become a virtual assistant before you’ve niched down. If you want to serve certain people, such as coaches for example, and there are services that they need that you don’t know how to do yet, you can learn. 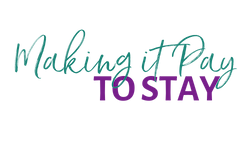 In fact, there are enormous opportunities to learn from courses like the Making It Pay Lifestyle Course. If you aren’t ready to invest in a course (which is tax deductible), you can learn any almost any software or skill by seeking information about training directly from the company who provides the software. Don’t forget that Google and YouTube! Choose a name with the future in mind. If you want to be the name and face of your business, use your own name, but if you want to be able to sell your business in the future without you having to keep working, consider giving a more niche-focused name that can transfer. Got your sights set on expanding and providing more than just virtual assistant services? Pick a name that is more general, but still conveys your field of work. Once you’ve picked a business name, you’ll need to find out how to set yourself up legally in your local community. Some places require licenses for county, city, and state. Others do not. You can check with your county office, or a local SCORE.org office, or even your local community college for information about that. Check to make sure your business name is available and register it. Decide if you’ll be a sole proprietor or LLC (LLC is highly recommended so your personal assets are not at stake if you get sued). Then, get an EIN free from the IRS if you’re in the USA. EIN stands for Employer Identification Number, but you’ll still need that even if you never have an employee. You don’t want to be giving out your social security number for business transactions. Determine how you’re going to do your billing, and keep track of your income and expenses. A great software option to look at is FreshBooks (extremely affordable – try it free for 30 days with this link). Freshbooks has a new feature which is double-entry accounting. You may be wondering what double-entry accounting is and why you should care. It’s an industry-standard accounting method that accountants and bookkeepers use to manage and track your business’s financial records. FreshBooks’ double-entry accounting functions have 8 brand new functions that are part of this industry standard system, including Balance Sheets, Trial Balance, Cost of Goods Sold, Bank Reconciliation, Charts of Accounts, Other Income, General Ledger, and Accountant Access. If you’re a one-man (or woman) show who has very few expenses and you’re happy with the basic functions of FreshBooks, you can ignore the double-entry accounting options. But, they’re always there for you if you want to grow and get a deeper look at your business. When you get to the point where you’ll have subcontractors, which are other virtual assistants working on your team, or if you decide to start creating digital products, courses, or membership sites as well, you’ll probably want consider using Freshbooks’ double-entry accounting features. I highly recommend it because the process is seamless and you can take a quick glance at your finances. You’ll always know how your virtual assistant business is doing and you’ll be able to manage your cash flow better. You’ll also be ready come tax season! You can bill hourly or you can bill by project or a combination of the two. It’s important to understand what you will bill for each thing because that’s how you’ll become profitable. Don’t set your rates too low, because you’ll have overheads. A good way to figure out rates is to determine what you need to earn per year to live plus have some fun, and divide that by how many billable hours you have room for. Don’t forget to keep about 15-20% out for taxes! You want to earn $60,000 per year but only work 20 hours per week. You’ll need to divide your yearly desired income by 52 (weeks of the year) or 50 if you want to take 2 weeks of vacation. Let’s go with 50. $60,000 divided by 50 = $1200.00 per week. Now, add 20%. So, $1,200 times 1.20 = $1,440. Now divide that number by the hours you have available and/or WANT to work. If you have 40 hours available, you’ll need to charge $36 per hour to hit your income goal. That needs to be consistent, and if you charge by the product and get better with time, you’ll earn more in less time. If you want to work part-time, say for 20 hours per week, you need to charge $72 per hour. That may seem like a lot, and it is, but if you continually upskill and are able to provide services such as website development and sales funnel creation, this is normal. In addition, if you package your services in a way that allows you to charge more or be on “retainer”, you’ll get more revenue. Finally, this is when it REALLY PAYS OFF to start having multiple streams of passive income through digital products, courses, and membership sites. It also is when hiring subcontractors becomes attractive because you’re able to work on higher paying revenue streams while your virtual assistants can take on lower paying client jobs. OK… I’m very passionate about telling people the earning potential for online business owners, but let’s move on. I think you’ve got the point! I completely understand the feeling of needing everything to be free when you’ve just decided to become a virtual assistant, but please do not build a free website. Use a good service like a self-hosted WordPress.org to make a professional website. There are people you can outsource this to for about $500 and up depending, on what you want in your website. 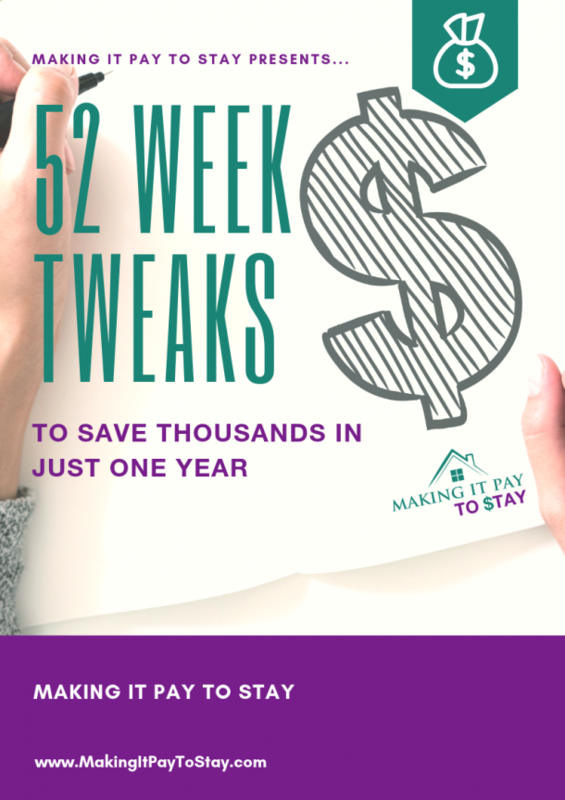 In fact, after you watch the free webinar for The Making It Pay Lifestyle Course, you can take advantage of a one-time-offer for me to build your website for just $497. You’ll have an SEO-friendly (this is important if you want people to find you!) and professionally done website with all the pages you need, completely branded to your new venture. I normally charge $997 for that level of website design so if you’re not techy or just don’t want to do it, I’d suggest going that route. 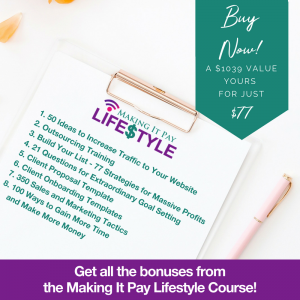 If you DO want to set up your own website, I do have an entire lesson in the Making It Pay Lifestyle Course showing you how. The final component of becoming a virtual assistant is to start promoting yourself as a VA. Use social media, networking in person and online, and every means at your disposal to get the word out about your business. Send proposals to every job opportunity that matches your skill set and availability. 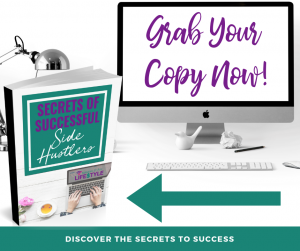 You can grab all my templates for a winning proposal, client onboarding, and tons of extra bonuses to get you on your way here. If you who set your mind to become a virtual assistant, I know you can do it and be successful! The industry is wide open and needs a variety of people with different skills to serve all the people who need someone to partner with them in their business. There are dozens of requests for virtual assistants every single day on social media, from virtual assistant organizations such as IVAA.org and VAinsiders.org, and most likely, the business owners in your local community desperately need your services – they just don’t know you exist! So, get started today, set your goals, and go after your dreams to work for yourself, when you want, on your own terms from home or anywhere you desire.